Adverse Childhood Experiences (or ACEs)1 — commonly defined as 10 types of child abuse, neglect, and family exposure to toxic stress — comprise a complex, population-wide health problem with significant detrimental outcomes. Past research has shown that exposure to ACEs is related to a range of poor adult outcomes, including increased risk of alcohol and drug use, mental health problems, poor physical health, and risky behaviors. Furthermore, research has shown that toxic stress, associated with exposure to ACEs, disrupts neurodevelopment and leads to impaired decision making, impulse control, and resistance to disease; increase in adoption of risky behaviors; and an early onset of disease, disability, and death. Unfortunately, exposure to ACEs is common in the general U.S. population, with about one in four adults reporting three or more ACEs. In 2012, the ACEs Public-Private Initiative (APPI), a Washington state consortium of public agencies, private foundations, and local networks, was formed to study interventions to prevent and mitigate ACEs, and facilitate statewide learning on these topics. 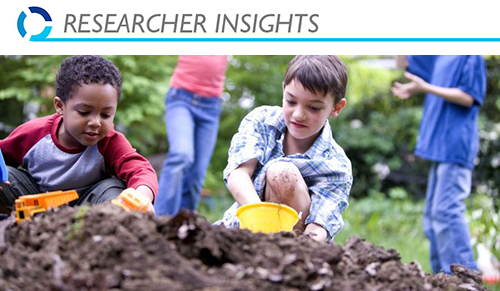 In 2013, APPI funded a three-year evaluation to study the efforts of five communities in Washington state that were working to address ACEs and increase resilience. The APPI evaluation assessed the extent to which the sites had the capacity to achieve their goals and examined the extent of the sites’ capacity to successfully complete certain strategies and reach their objectives, as well as the impacts of these strategies on ACEs-related outcomes. (For more information on the evaluation and its findings, see Hargreaves, et. al., 2016.) When no valid and reliable measures of collective community capacity to address ACEs and resilience were found through an extensive literature review, the evaluation team created the ACEs and Resilience Collective Community Capacity (ARC3) survey. To learn about ongoing and newly developing ACEs-related initiatives, the ARC3 survey was intended to be a survey of coalition members and partners, including residents involved in the ACEs- and resilience-related efforts. Grounded in the community capacity building theory and recognizing the value of using community capacity building and empowerment strategies to improve health and well-being of their residents, the ARC3 survey was designed to be used for independent evaluation as well as monitoring and improvement efforts by communities. It helps gather data at four nested levels or layers of capacity: (1) core team or coalition capacity to develop and sustain a strong infrastructure; (2) network capacity to work collectively across sectors on community change; (3) capacity to plan and implement community-based solutions addressing ACEs and resilience; and (4) community-wide capacity to empower the entire community to work at scale to achieve community-wide results. These capacity levels are shown in Figure 1. In 2015, a pilot version of the survey was administered to members and community partners of three (non-APPI) community coalitions in Washington state. An analysis of the pilot survey results showed that the 10 domains in the ARC3 index were strong.3 The pilot also provided valuable information about the user experience, including length of the survey, clarity of the items, and survey structure. The evaluation team revised the survey based on this feedback. (4) background characteristics, which asked about the respondents’ or their organizations’ sector of work and the population they worked with. The final survey was administered to the five APPI sites in February and March 2016. The overall survey response rate was 84.4%. Analysis of the final survey’s results showed that the internal consistency of the 10 domains of the ARC3 index was strong.4 The survey’s capacity scores also reflected the sites’ capacities described in the interim and final APPI evaluation reports (Hargreaves et al., 2015; Verbitsky-Savitz et al., 2016). This corroborative evidence supports the validity of the survey’s results. What works to address ACEs? 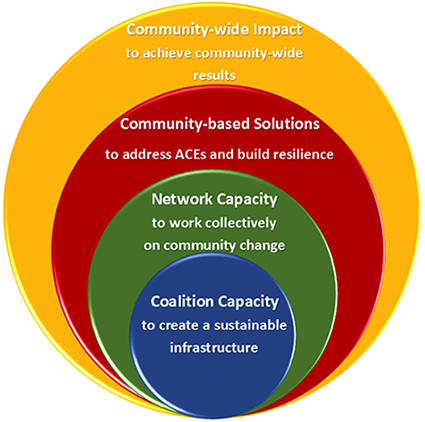 This finding suggests that to prevent ACEs and increase resilience on a population scale, it is important to identify effective community change strategies to achieve that goal, and align the community’s network structure and collective capacity to support those strategies. Thus, there is not one “best” network structure, set of interventions, or type of coalition capacity to address ACEs and increase resilience in all communities. Rather, these factors need to be aligned to achieve community impact (Hargreaves et al., 2017). Work is underway to continue learning from and adapting the survey for other health issues. For example, the survey is currently being adapted for the Population Change Learning Community Initiative, supported by the UCLA Center for Healthier Children, Families, and Communities, and funded by the Doris Duke Charitable Foundation. The survey is also under consideration for the evaluation of community capacity in 100 Million Healthier Lives, convened by the Institute for Healthcare Improvement, and by Essentials for Childhood, a CDC-funded initiative co-directed by Washington state’s Departments of Health and Early Learning. 1 ACEs are (1) emotional abuse, (2) physical abuse, (3) sexual abuse, (4) emotional neglect, (5) physical neglect, (6) mother treated violently, (7) household substance abuse, (8) household mental illness, (9) parental divorce or separation, (10) incarcerated household member. 2 Ten of the ARC3 domains are measured using the ARC3 index in Part 2 of the ARC3 survey. The 11th domain — goal-directed networks —is measured using the Extent of Collaboration questions in Part 3 of the survey. 3 They ranged from “acceptable” (Cronbach’s alpha = .69) to “excellent” (.91) for internal consistency (Hargreaves et al., 2016). 4 They ranged from “acceptable” (.76) to “good” (.85). 5 The final two sites (Whatcom and NCW) did not have sufficient data to determine the effectiveness of their community projects.